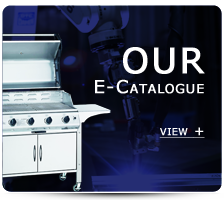 Our business was established in 1988 for professional manufacturing of BBQ products, starting from the production of fittings for general gas switches to nowadays CE , ETL and ISO9001 approved production of BBQ grill, patio heater etc. Either diversified categories of complete specification or development and production on OEM fashion based on customers' need are available. Believing that price advantage does not deliver long-term product competitiveness. Shie Hsang Industrial strictly maintains product quality and actively develops R&D and technology. We also select parts and materials carefully to make sure they are non-toxic and conform to environmental standards ROHS. We not only manufacture excellent grills, but also design grills in order to meet customer’s satisfaction. Standing by our commitment to high quality and global sales, we export 100% of our products mainly to regions such as Europe, Central / South America and North America. The company has won steady support and acclaim from their customers with the exceptional quality products which has brought sales growth. Looking toward the future, Shie Hsang Industrial will not only strive to offer even better quality products to their customer, but also looks to expand their production facilities at an overseas location such as Vietnam, so our products can be seen in every corner of the world. We have started our domestic sales since 2009 in order to bring service and satisfaction to customers in Taiwan.